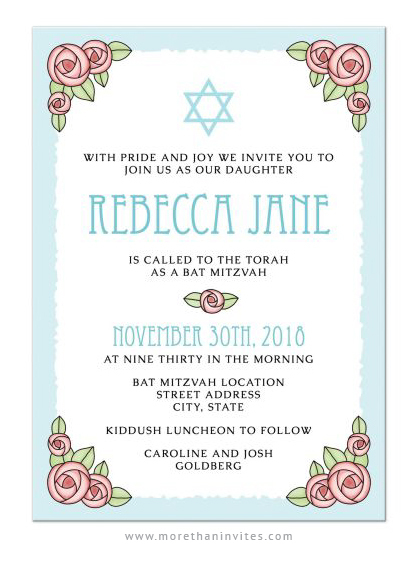 Bat mitzvah invitations featuring decorative corners with pink roses and green leaves, and a light blue Star of David. Along the edge is a blue border. The white area in the middle has jagged, irregular edges reminding of a torn paper. Cute and somewhat whimsical design with pretty, pink flowers. High quality, full-color, full-bleed printing. Several paper types to choose from. Featuring custom printed stationery and party supplies from Zazzle, Redbubble and Lemon leaf prints. Most products are designed by Maria from Mhea Design. Follow her on Facebook or view her designs at Lemon leaf prints. More products can be found at Happily Printed and on Pinterest.